Dolphins are among the most beloved animals on the planet and if you have always dreamed of meeting a dolphin face to face, you cannot miss this tour! We invite you to meet our marvelous bottlenose dolphins and make new friends! There is no greater joy than spending time with these friendly and playful creatures. You will be amazed at how much you can learn about these mammals through observing and interacting with them. Our modern dolphin facility is located on Blue Lagoon Island, only a few miles off Paradise Island, bahamas and while our catamaran takes you there, you can enjoy the beautiful view of the coastline. Before introducing you to our dolphins, an animal trainer will tell you about their social patterns, diet, and much more. We want this experience to be both fun and educational and what better way to learn than to get hands-on experience after the theory? Experience the joy of meeting and interacting with a dolphin! When you hug and kiss one of these friendly creatures, you will realize just how magical a dolphin encounter can be! As you are standing in waist-deep water, you will have the opportunity to apply training commands and watch the animals perform. Observe how the dolphins interact with each other and learn about their role in the complex underwater ecosystem. Each participant gets ample time to interact with these beloved creatures. Through our photography and videography service, you have the option to purchase photos and videos of your dolphin encounter. In addition to meeting the dolphins, you will get to explore our state-of-the-art facilities. On three acres, our dolphin habitat features training areas, a galley for food preparation, as well as amenities like locker rooms and a souvenir shop. Each person is guaranteed between 5 - 8 minutes with the dolphins. 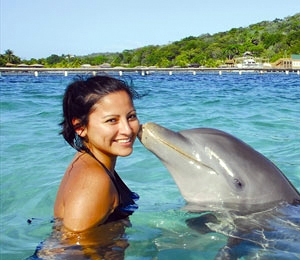 I have been to the Bahamas many times, but Blue Lagoon Dolphin Close Encounter is one of my favorite trips! It includes everything that everyone should do here. As a Bahamas veteran, I can say only the best about this experience!